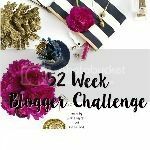 So I’ve been trying to linkup with Girl Talk Blog and Sarah Emily Blogs every Monday for their 52 week blogging challenge this year and I’ve been doing pretty darn well, until this week when I read the prompt and had NO IDEA what to post about. Be the change you wish to see is the prompt and there are sooo many different ways this could go. But, seeing as these are open to our own interpretation I think i’m going to go in a wildly different direction, go super personal, and talk about how I went from awkward human to awesome human. At least I think i’m pretty awesome :-] . To me, being the change I wish to see was all about working on my own personality to become the person I wanted to be. I set a goal for myself to be less shy and to be less afraid of social situations. I was a painfully shy child (my mom affectionately called me her Velcro child for years) who rarely spoke to anyone that wasn’t a close family member or friend. I was always so afraid of what people would think of what I had to say that it was easier to just stay quiet. I’ve mentioned this before but i’m an introvert who is dying to be an extrovert and I really think i’ve made some massive changes in myself that have helped me to come out of my shell more. I don’t find it as exhausting to be in social situations anymore and I’ll even *gasp* talk to people on the phone when I need to. So, how did I do it? How did I go from Awkward child and teenager to Awesome adult? ***None of this is saying that there is anything wrong with being an introvert, I love spending time by myself and everything else that is a characteristic of being introverted, but I do feel like i’m missing out on things a lot and that’s why I wanted to work on myself. I made a point to find the most uncomfortable job I could imagine. I needed to get over my fear of talking to people so I got a job as a teller in 2012. Every single work day I had to talk to about 100 different strangers a day. It was horrible. But, over time I realized just how not scary people are. In fact, once you talk to strangers 100 (at least) times a day, it kinda becomes easy to do. I even found myself making small talk with people, saying hello to everyone I saw in a hallway or store. Fast forward to 2015 when I went to Europe BY MYSELF and met a bunch of STRANGERS. I have changed dramatically over the past few years and I really am loving the person I am now. I wanted to be a certain way and I made that change happen. Now that all that sappiness is over, here are some awkward photos of me because Alex from Always, Al is hosing an Awkward and Awesome linkup and I think me going from wallflower to semi-social person is enough awesome so we need some awkward up in here. Plus, read my last Awkward and Awesome post here! I‘m great at posing for pictures with Santa. Clearly he doesn’t freak me out at all. You might not be able to tell but that is my “get me outta here i’m so uncomfortable” fake smile. And i’m white knuckling that present in my hand. Me walking like a newborn fawn. Learning to walk slow enough for a wedding is DIFFICULT guys, it really is. Look at all that effort my face is putting in. Photographer: Strike a funny pose! Me: Hunches over and grimaces. At least everyone else looks great. Question of the day: Is there something you’ve changed for the better in yourself? If so, how did you do it?